A poem by David Wagoner, from the Hudson Review, Summer, 2009. 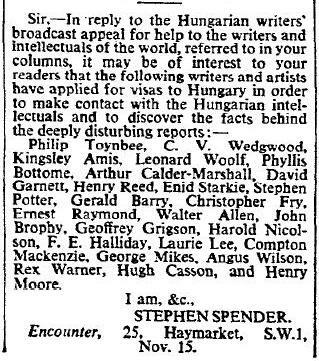 He seems to be describing an actual party hosted by Stephen Spender, which would have taken place on an evening in October or November of 1956, in the midst of the Hungarian Revolution. According to Wagoner's text, Cyril Connolly, John Hayward, Rose Macaulay, Herbert Read, and Allen Tate were also in attendance. In the poem, Wagoner specifically mentions St. John's Wood as the destination, and that makes sense, as the Spenders had been living in Loudoun Road (photos on Flickr) since 1945.